The Hellcat is surely one of the most recognizable planes of WWII, and rightly so. No other aircraft achieved the kill ratio that the Hellcat and it pilots racked up in the last three years of Pacific War. Although it was based on its almost equally famous older brother, the Wildcat, it was a whole new plane in every regard. It was faster, more powerfully armed, better armored and altogether a more effective and versatile plane than the Wildcat and it proved to be the bane of the Japanese Navy and Air Force pilots wherever they encountered it. ..and now Eduard have released this great model. It's too early to say as I haven't built it yet, but this looks to be one of the best kits released in 1/72 this year. 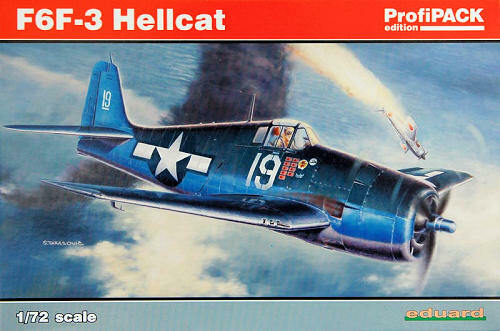 Although I am not familiar with it, I'm told Eduard have scaled down their 1/48 version of this kit, which should make it one of the most accurate Hellcats available. Surface detail is absolutely stunning. Panel lines are recessed, very thin and clear, and rivet detail is very well done and understated. I'm almost afraid it will disappear under a coat of paint. I'm particularly impressed by the fuselage structure, which correctly shows the overlap of the panels and not the usual recessed panel lines. Detail on other parts is decent. Two sets of wheels are provided, with diamond and normal thread and the hubs are separate (thanks Eduard), but the shape of the Hamilton Standard propeller is a bit suspect. A quick test fit of the fuselage shows it aligns perfectly. As this is the ProfiPack edition of the kit, it comes with lots of goodies. You get not one but two photo-etched frets, one of which is pre-colored and consists of parts to spruce up the cockpit. As I've never worked with Eduard's colored variant before, I'm curious to see how it will end up. The other fret provides the ignition harness and some additional detail to the bombs and other external detail. The photo-etch definitely brings out the best in the kit, although even without it (I don't doubt a Weekend edition will be forthcoming) it will other kits such as Hasegawa's or Academy's in terms of likeness and detail. 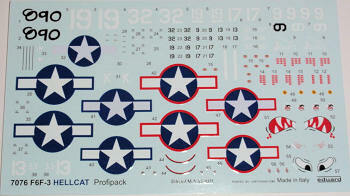 Also included in the ProfiPack Edition is an Express mask to quicken that pesky job of masking the canopy. 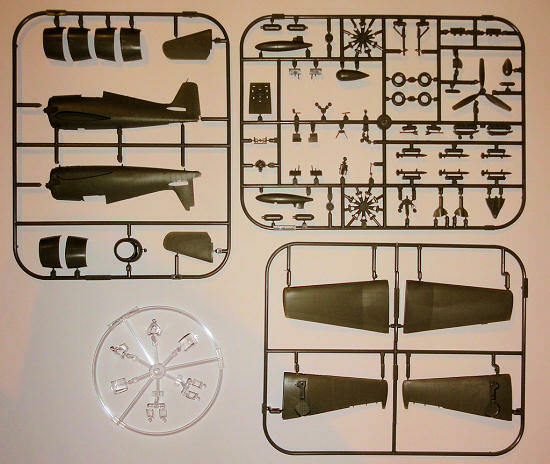 Eduard has created different boxings of this kit for the F6F-3 and -5 variants, but it looks to me like the sprues contain parts for both, as two different canopies, missiles, radar and 20mm canon barrels are included. 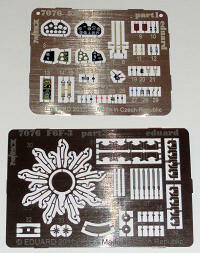 Naturally, you only get decals for the -3 variant, but with five schemes to choose from, that's forgivable. They are printed by the folks from Cartograf. Color callouts are for Gunze's Aqueous and Mr. Color ranges only. The manual is clearly laid out and provides beautifully drawn four-view color drawings of all schemes. It was high time we had another Hellcat in 1/72, and Eduard have delivered the goods with this one. Even this richly-featured ProfiPack edition is sensibly priced, and I'm sure Dragon will have a stiff fight on their hands when modelers have to choose between their (considerably more expensive) kit and this offering from Eduard.